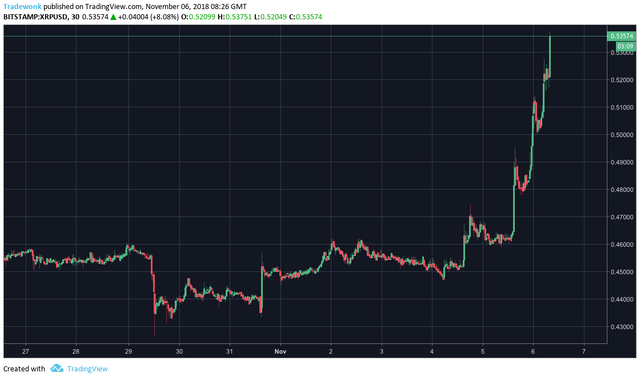 XRP to takeover Ethereum's position very soon ?steemCreated with Sketch. It could explode at any moment from here! Ripple continues with surprising with big news and partners. Lately that they will open a office in Dubai in 2018. What cause the big spike, no one knows but i think it's about time that it will take over Ethereum position. It's always fun to come on here and see what is possible in the near future regarding any crypto you're interested in. Keep up the good work, I see XRP hitting 10$-15$ by 2020. Been watching xrp too, glad to see its rising. @tradewonk if there is any research pertaining to this post, please share. It's also possible it can be down again probability. I hope it will soon. I'm looking forward to it. Your UA account score is currently 4.605 which ranks you at #1704 across all Steem accounts. Your rank has improved 1 places in the last three days (old rank 1705). In our last Algorithmic Curation Round, consisting of 243 contributions, your post is ranked at #120.